Male wild turkey displaying; photo by Len Blumin on Flickr (noncommercial use permitted with attribution / no derivative works). Alabama designated the eastern wild turkey as the official state game bird in 1980 (the official state bird is the Northern flicker, adopted in 1927). Alabama has one of the largest per-acre populations of wild turkeys of any state in the United States. A true native American, the eastern wild turkey (Meleagris gallopavo silvestris) is the largest and most widely distributed of the six recognized subspecies of wild turkey in North America. The male (Tom) can grow up to four feet tall and weigh well over 20 pounds. Hens may be almost as tall but usually weigh no more than 12-14 pounds. By the early 1900's wild turkeys had all but disappeared (a result of commercial harvesting and habitat destruction). 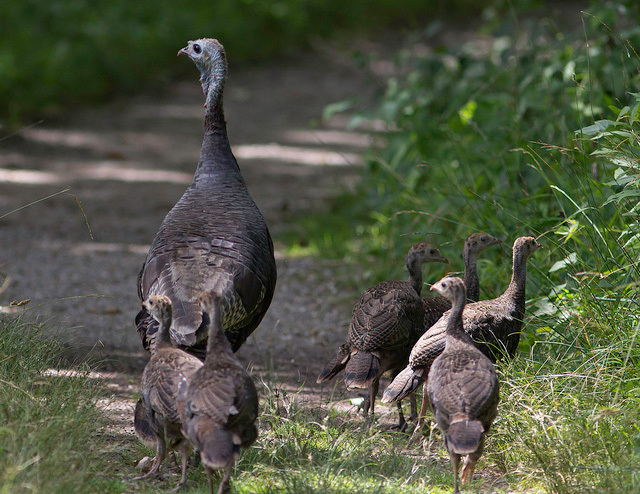 Fortunately, conservation and wildlife organizations intervened, and the wild turkey made a dramatic recovery - today 6.4 million wild turkeys roam the lower 49 states. Turkeys are unique, resilient, and prolific. 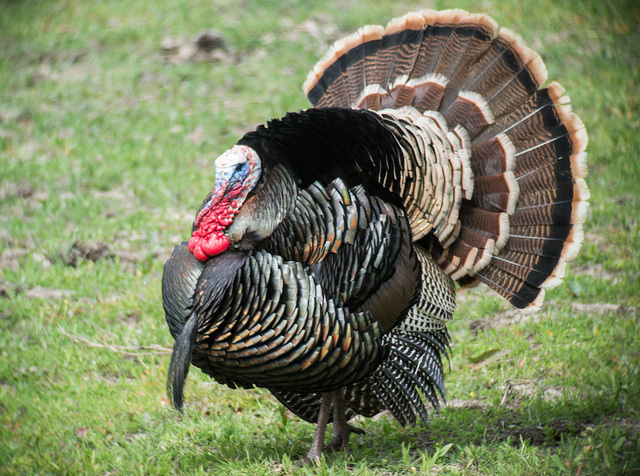 The male turkey strives to mate with many females. Toms begin their breeding displays in early spring - strutting proudly for the hens with fanned tail and fluffed feathers. The Toms' head turns a bright red during this mating display. Toms have nothing to do with the poults (baby turkeys), leaving all nesting and rearing chores to the female. A turkey hen lays 9-12 eggs in a shallow nest where she incubates her clutch for about 28 days. She then leads her newly hatched brood to forage for insects, berries and seeds. Wild turkey hen with poults; photo by Steve Burt on Flickr (noncommercial use permitted with attribution / no derivative works).